Etch LP Menu | Hawk Research Laboratories, LLC. 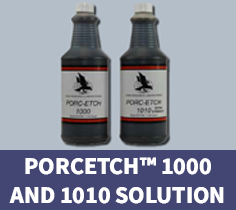 PorcEtch solution is a concentrated mixture of several acid-bearing compounds that are designed to perform consistently and break down the original glaze finish on bathtubs, sinks and wall tile and extends coating lifespan. PorcEtch solution has a stabilized base which allows a high level of control over the etching process to produce an even surface without pitting. 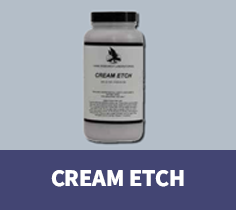 Cream Etch is effective for most etching applications and chip repairs. The paste-like consistency provides concentrated and accurate etching capabilities needed for repairs.